This is also the third installment of Cooking 101; today I want to share a quick tip for working with dough. 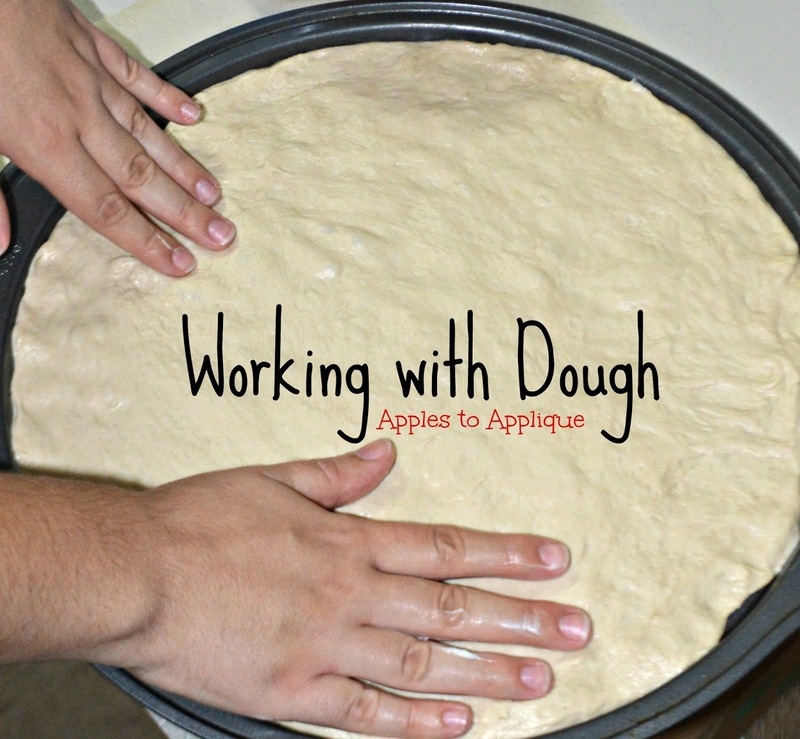 Do you ever have a problem with dough sticking to your hands when you're working with it? Recipes always suggest putting flour on your hands, but I have found that only works for about 30 seconds, then the flour gets worked into the dough and the dough starts sticking to my hands again. Finally, my mother-in-law told me to spread a thin layer of shortening on my hands instead. It works so well! 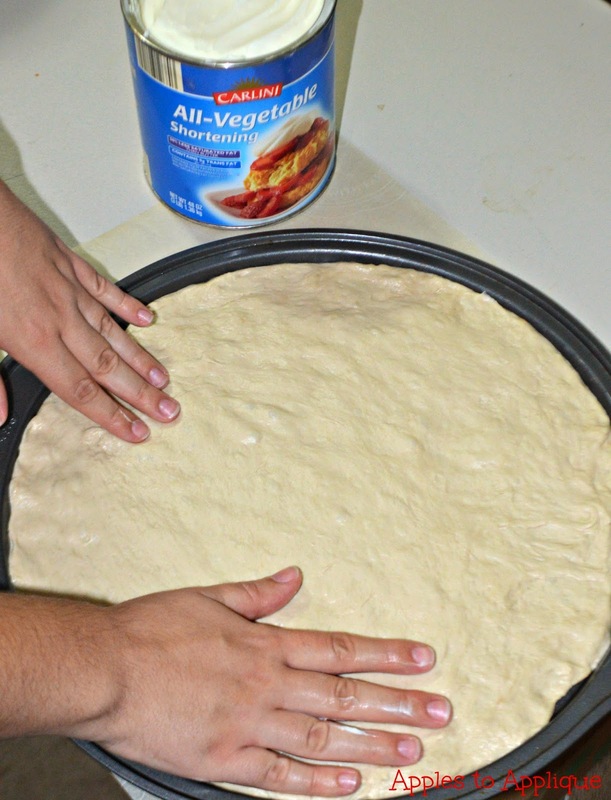 Just a thin layer of shortening on your hands and the dough will not stick to you at all. You don't have to reapply it every 30 seconds; it works for the entire time you're working with your dough. I was able to quickly spread out this pizza dough without fighting with it. So the next time you're working with dough, try using shortening on your hands instead of flour, and save yourself the mess and headache. Check back next Tuesday for another quick tidbit, or later in the week for more in-depth posts on a multitude of topics. Until then, happy cooking! This is a great tip! I would never have thought about putting a bit of shortening on my hands to keep the dough from sticking. Right? Me neither! So simple, and yet it makes a world of difference in my frustration level. Great tips.. my daughter always want to make us homemade pizza.. i will show her this and she can use the dough..
Aww, how fun! This should make spreading pizza dough much easier for her; at least, it has for me! think this will work with GF dough too? I can't make any guarantees since I haven't tried it, but I can't see why it wouldn't. Oooh, homemade pizza is so good! I would totally make this but my son refuses to eat anything that has dough if I make it after our donut incident. Oh no! The donut incident must have been rather traumatizing...now I'm curious. I really enjoyed this tutorial. The step by step photos were very useful in visualizing the tips and steps. I wet my hands with water when working with dough, usually. But I have to keep rewetting my hands. I'll try the shortening next time.